Leasing Available from $47.86 per month! The Avision AV300 series is one of the world's first A3 sheet-fed scanners. 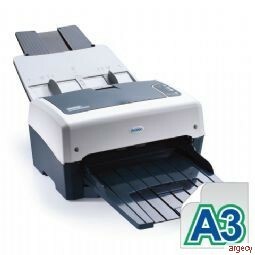 The AV320+ is able to perform 50 pages per minute in simplex mode and 100 IPM in 200dpi duplex mode. Avision also comes with the exclusive software application, the Avision Button Manager. As a custom feature, Avision Button Manager allows you to copy, send e-mail, and perform simplex or duplex scan at the press of a button. There are also a total of 9 sets of button numbers allowing you to set your preferable scan settings or destination applications to make scan as easy as 1-2-3!